A very young Flame Angelfish, Centropyge loricula, with a belly full of Apocyclops panamensis copepod nauplii. Image credit: Avier J. Montalvo. Attendees of the 2018 MBI Marine Breeder’s Workshop in July first heard the news that first-feeding Flame Angelfish (Centropyge loricula) will consume the nauplii of Apocyclops panamensis (often humorously dubbed Apocalypse pods). To date, the nauplii of Parvocalanus crassirostris (Parvo) has taken the spotlight as the go-to tiny copepod fueling progress in the pursuit of pelagic spawning marine fish species with their tiny, rotifer-refusing larvae. Parvo is certainly here to stay for the foreseeable future, but it is relatively difficult to culture compared to more familiar feeds (rotifers, Artemia, and benthic copepods), requiring live phytoplankton and accepting no substitutes. Without highly intensive culture methodologies, a larval rearing run of a pelagic spawning fish like a Centropyge spp. angelfish may require as much as 450 gallons of Parvo copepod culture simply to provide the copepod nauplii needed to meet the food demands of a single 20-gallon vessel containing a few hundred eggs from a small angelfish species (as estimated by Matthew Carberry of Sustainable Aquatics during a Q&A session at the same Workshop). This calculation doesn’t even take into account the amount of phytoplankton production required to maintain that volume of copepod cultures. Parvo, while effective, may simply not be economically viable, at least not at this time. Meanwhile, the ability to culture Apocyclops panamensis on prepared algae pastes (including those used to rear rotifers) eliminates one of the more labor-intensive aspects of live food production and could save valuable space in a small-scale hatchery or fishroom (I once calculated that it took approximately eight hours per month just to produce a couple gallons of phytoplankton per week; what’s your time worth?). The consistency of prepared algal products can also eliminate an important nutritional variable in the overall live feed equation. 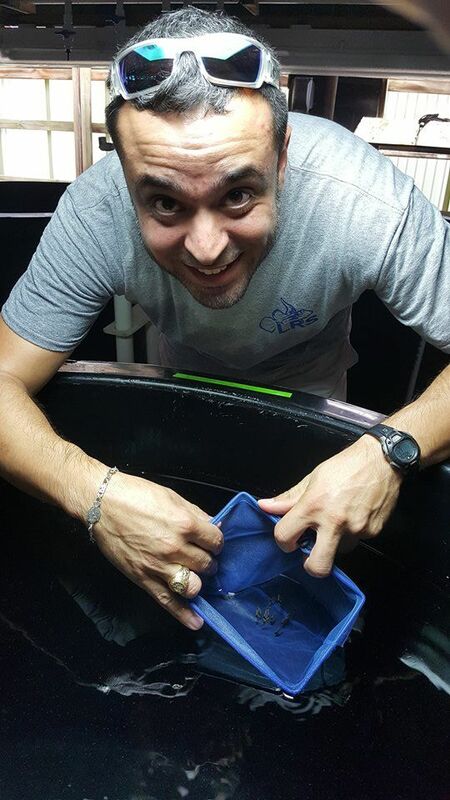 Avier J. Montalvo showing off dozens of captive bred Lemon Butterflyfish in 2016. If A. panamensis proves to be a more forgiving organism in culture than Parvo, and particularly if higher nauplii production levels can be achieved, it will be an ideal first-food candidate for marine fish larviculture research. 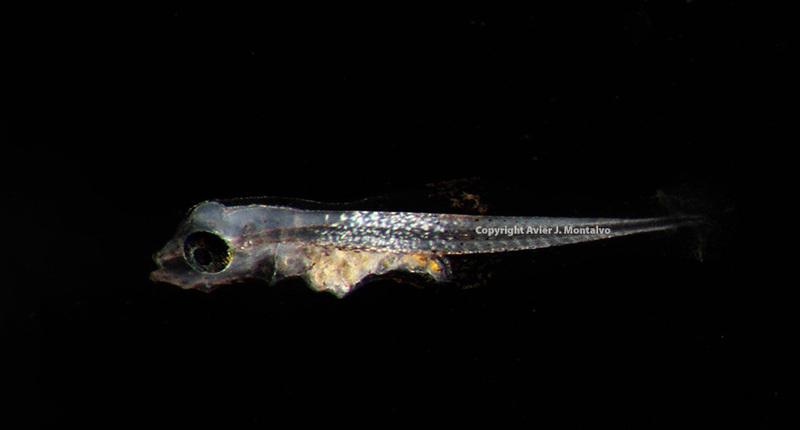 Then, if experimentation proves A. panamensis as a viable first-food, particularly with species that before now had only been reared with Parvo, we could see A. panamensis eclipse Parvocalanus crassirostris as the go-to first feed for pelagic-spawning marine ornamental fish larvae. The bottom line is this: many hobbyist marine fish breeders really don’t enjoy culturing phytoplankton, and they’re not very good at it (when compared to professionals who do that, and that alone). Phytoplankton culture is time-consuming with no economic savings to be had at a hobbyist scale (especially once you factor in the value of your time). The ability to culture A. panamensis using prepared feeds makes it an easy-to-add food organism alongside rotifers, brine shrimp, and commercially-prepared larval rearing diets like Otohime and derivative products. Hobbyists won’t have to return to culturing live algae like they would if they selected to culture Parvocalanus crassirostris. Seeing conclusive evidence that a difficult-to-rear marine fish larvae will accept A. panamensis nauplii as a first-feed is exciting news for small-scale breeders. Whether it will perform as a viable first and/or exclusive larval food remains to be seen, but research is already conclusive that even occasional feedings of copepod nauplii are highly beneficial to a wide range of marine fish larvae. Even in routinely bred marine fish species like clownfish or dottybacks, the use of this copepod in conjunction with or in replacement of rotifers could vastly improve the survivability and quality of marine fish being produced. Visit the recent announcement from Reed Mariculture debuting their Apex-Pods for more information on Apocyclops panamensis.